The series of dunes along the shore in North Beach Haven are among the highest on the island. This is one of the reasons why we chose to buy a house at this location. Our beach remains wide despite occasional beach erosion from hurricanes and nor' easters because of the size of the dunes. This beach has always "come back" on it's own after such events without the necessity of having the township resort to backfilling. Over the past 30 years, our dune has more than doubled in size and that makes us feel very good! There is a $500 fine for walking on the dunes. Please ask your children to respect our dunes and please report violators if you witness anyone trespassing on them! They're our only protection from violent ocean storms! For your swimming safety, from the middle of June until Labor Day, there are lifeguards posted on our beach from 10am until 4pm every day. 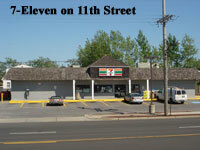 The lifeguard stand is located 100 feet north of the 16th Street entrance, as shown in the photo to the upper right. Lifeguarding has come a long way since we first started using this beach. 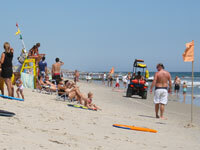 Today, lifeguards have numerous floatation devices and access to instant emergency medical attention. This particular beach is also a "hot spot" among local fishermen! 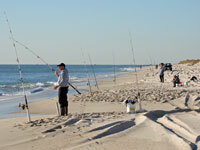 It is not unusual to see blues, large stripers, kingfish and other species being caught off our beach. The best time of year is late October through early November, but Spring is also a good time for surf fishing. 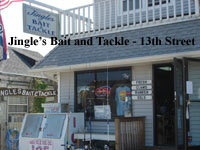 A quick visit to Jingle's Bait and Tackle Shop on the west side of the Boulevard at 13th Street will have you surf fishing in no time! 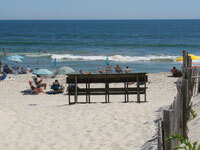 The beach at 16th Street in North Beach Haven has always been one of the nicest swimming beaches on the island. 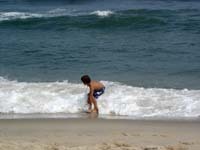 Beach activities are limited only by your imagination, but one of the fastest growing sports among children is skimboarding. It has really taken off in recent years. On the right, Fisher Greene of Oviedo, FL, takes advantage of the shallow waves at water's edge on 16th Street to practice his new-found skimboarding sport. 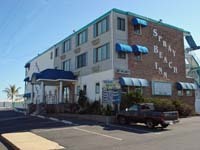 After signing up for "Skim Camp," sponsored by the Surf Shack in Ship Bottom (pictured below and right), Fisher attended the Camp and took part in the group lessons (left) in 2007. It was a great way to pass a summer's day and learn proper techniques! By the end of that summer he became so interested in watersports and the sport of skimboarding on the beach that he practiced up and got himself ready to compete. In 2008, he participated the annual national skimboard championships last summer and hopes to some day compete in them again. These east coast skimbording competitions are now held every summer at Barnegat Light and attract skimboarders from all over the country! Many contestants were from states all up and down the eastern seaboard and even the Great Lakes, where skimboarding has also surprisingly taken off up there. 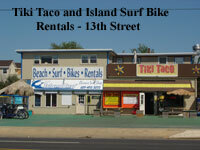 Locally, the Surf Shack (on the right) rents boards, provides lessons and handles a complete stock of surf gear. Ron Jon's (pictured on the left) is probably one of the most interesting and well-stocked surf shops on the entire east coast, featuring a full array of skimboards and surfboards, along with wetsuits and anything else you could possibly imagine having to do with boarding sports. 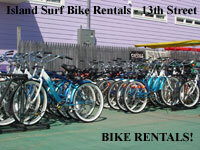 The Island Surf Shop also sells and rents boards and they also rent bikes. 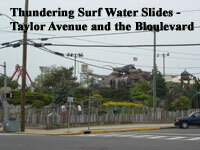 Less expensive boards and other surf gear, such as boogie boards, can always be found at Hands. 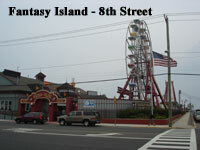 Fantasy Island is just down the street and offers a full compliment of arcade games and rides. Be sure to check the local Sandpaper or Beachcomber for announcements on appearances at the park of all kinds of talent... mimes, cartoonists, clowns, etc. 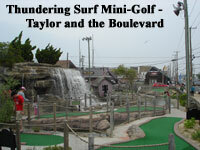 If it's real action you're after, take in an afternoon at Thundering Surf. The water slides are tons of fun and the water park features water cannons and a "lazy river" raft ride that's bound to cool you off. If you're concerned about your child's swimming abilities or confidence in the water, we highly recommend the swimming lessons at the St. Francis Community Center. The indoor pool enables scheduled classes in any kind of weather. Call ahead and make a reservation while you're on vacation! Need more suggestions? 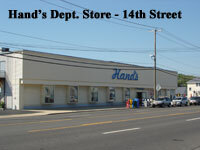 Some of the best surf fishing can be had right here on 16th Street! If it's a boat you're after, smaller fishing and crabbing boats can easily be rented anywhere along the bay. Perhaps you'd prefer a larger boat for some serious deep-sea fishing. Party boats such as the Carolyn Ann III leave Barnegat Light every day. There are also local captains that will take you out on their charter boats for a more personal fishing trip. Many of these boats can be found along the peir at Barnegat Light and offer a wide array of fishing trips. 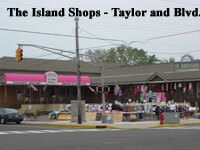 And while you're up at Barnegat Light, be sure to tour all the shops and commercial fishing sights at Viking Village. 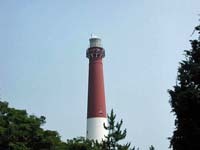 And no trip to Barnegat Light is complete without a full-fledged tour of "Old Barney." The Barnegat Lighthouse can be a very interesting and educational rainy day activity. If you're planning to tour the inside and walk all 217 steps to the top (we highly recommend this), do call ahead or check the website to determine the hours of operation. 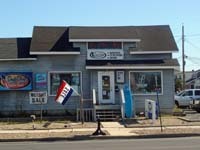 There are many interesting shops at Barnegat Light besides the ones at Viking Village, including Andy's, a must-see for the kids! The historical and botanical tour of the park at Barnegat Light has excellent examples of the island vegetation that was native to the island more than a hundred years ago, most of which has disappeared elsewhere on the island because of development. If fishing is not your thing but you love boats, there are just plain boat cruises! The Carolyn Ann III offers evening cruises out of the Barnegat Inlet, or you can take one of our favorite local cruises right out of Beach Haven on Black Whale Cruises. 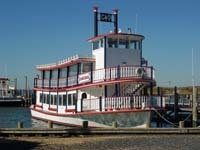 While the original Black Whale is no longer in Beach Haven, they now own a new sternwheeler called the Crystal Queen that replaced the old Black Whale. This boat makes many daily and evening cruises. There's a short, one-hour evening cruise around the bay and they also offer two daily four-hour round trip cruises to Atlantic City! The excursion drops you right off at Trump Marina for a mini, two-hour gambling experience. There's even a band on board with an open bar. Slot tokens are included in the price! There are just so many things to do on the island, you won't possibly have enough time to do them all. Perhaps the best place to check online before your vacation even starts is the Southern Ocean County Chamber of Commerce website. Click on their "Community Calendar," select the month in which you'll be on LBI and a list of just about every current activity pops up... everything from what's playing at the Surflight Theatre to art festivals, flea markets and antique shows. 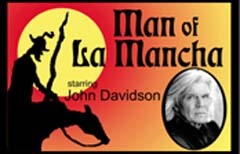 Actor John Davidson recently appeared in "Man of La Mancha" at the Surflight Theatre and it's not uncommon to see well-known actors in this theater. 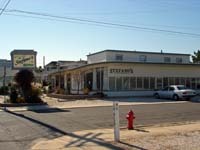 Many have gotten their start at the Surflight. 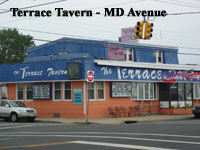 Let's not forget Mr. Tee's, which is just a very short walk over to 18th Street and west of the Boulevard. 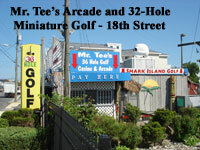 It's a combination arcade and 32-hole miniature golf course practically around the corner! And make sure you stop at Dairy King on your walk back home.for ice cream. 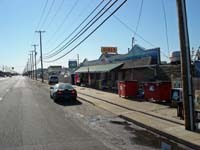 It's on the Boulevard at 18th Street (picture below right)..
No library of "Things To Do" on the island would be complete without directing everyone to the Southern Ocean County Chamber of Commerce website. 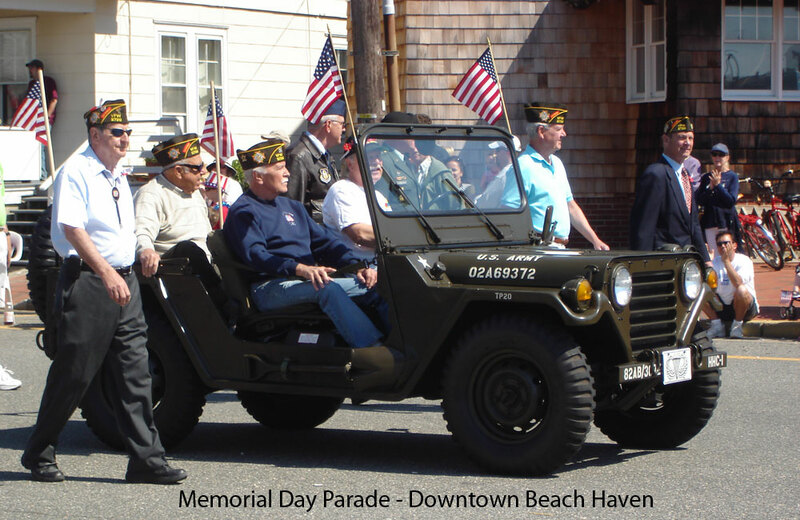 There is a schedule on the website every year and it's an excellent guide to what's happening each and every day during the summer on LBI. It's loaded with so many ideas, you won't have time to do them all! And if you're on LBI in the fall, don't forget Chowderfest Weekend, which is always the weekend before Columbus Day Weekend. 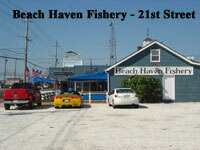 Practically every restaurant and shop in Beach Haven offers huge discounts on this fun-filled weekend! 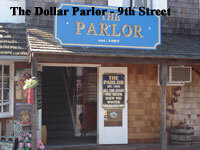 There are a host of unusual, entertaining and fun things to do within a short drive of Long Beach Island. 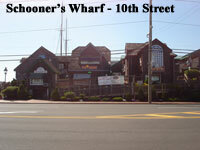 If it's a real New Jersey boardwalk you're after, we'd highly recommend the boardwalk in Ocean City as the place to go. It's a nice, clean, family-type boardwalk. 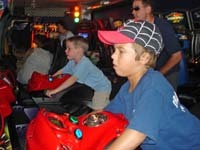 On the right, Fisher Greene from Oviedo, FL rides the motorcyle ride before having pizza at famous Primo's Pizza on the boardwalk. 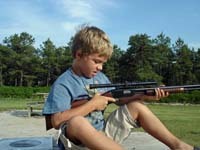 Afterward, in the picture on the left, Fisher learns gun safety from "Grampa Amon" at the shooting range off of route 539, west of Manahawkin. This range is for small-arms target practice only... shotguns, pistols and .22 calibers. This is a real "out in the woods" shooting range in the middle of the New Jersey pine barrens. 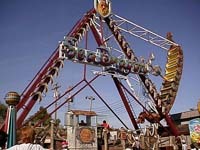 Within a short drive of Long Beach Island are some other very unusual and fun-filled things to do.The Six Flags Great Adventure theme park guarantees a complete day of fun-filled rides and attractions and also features a water park and a drive-thru zoo! You can spend an entire afternoon looking at the animals or spend the entire day getting wet! There are so many things to do there that you will never have enough time to do them all! 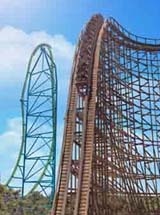 I've furnished a picture of one of the roller coasters on the right. This is an easy drive and a great way to spend a not-so-nice day away from the beach. Also located within an hour's drive is the New Egypt Speedway shown on the lower left. 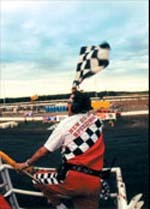 This track was rescued from ruin in 1997. Close to 150 race cars compete weekly at New Egypt every Saturday night from April to October, plus a slate of high-profile midweek specials featuring some of the top national tours and biggest celebrity drivers in the business. This is an action-packed Saturday night your kids will be talking about for years to come. There are many interesting educational day trips you can make, all within several hours' drive of Beach Haven.. South Jersey and the New Jersey pine barrens is loaded with history, including the historic Revolutionary War-era Batsto Village and the very interesting tour offered daily at The Renault Winery in Egg Harbor City. The best time for this winery tour is in the fall because they harvest the grapes and process them at this time, but they do offer tours throughout the summer months. 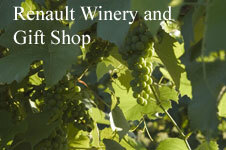 The winery is not in operation at this time because the grapes have not yet been harvested, but the tour is still operating and this can all be done easily in one day along with the Batsto Village tour. Drive off the island and, instead of taking the Garden State Parkway south, head south instead down Route 9 through Parkertown, West Creek, Tuckerton and New Gretna. You'll love the local sights and shops along the way and get to experience the "old" shore road as it was before the Parkway was built in the 1950's. The quaint town of Tuckerton offers many antique shops and restaurants and the sights along the way will make you want to take this old shore road many times again. If you're still interested in south Jersey after taking in these interesting tours, you can always plan another day trip to beautiful and historic Cape May. This will be an all-day trip in and of itself. There are many shops and restaurants and lots of delicately ornamented old Victorians to see. The drive along the ocean from Long Beach Island is a breathtaking drive of some of the most beautiful areas in New Jersey. Once you've arrived, take in the newly renovated downtown area as well as a walk along the boulevard that runs along the ocean. 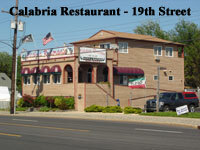 There are many fine restaurants to visit also. Because of the distance, you might want to make Cape May it's own day trip. 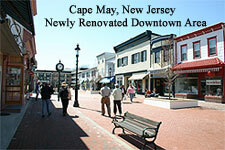 There are so many thngs to see and do in Cape May, it will engulf your entire day and you still won't see it all! Don't forget to visit Lucy The Elephant in Margate. South Jersey has so many interesting points of interest, you'll find yourself setting aside one day of your vacation every year to tour the sandy side roads of the Pine Barrens. 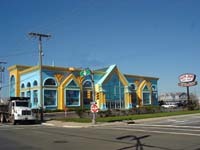 And while you're at it, don't forget to stop at the Sweetwater Casino in Sweetwater, NJ for lunch on the Bass River. If all of this hasn't slowed you down and you happen to be on LBI in the fall, don't forget the annual Chatsworth Cranberry Festival held every year in October in Chatsworth, NJ. "Cranberry anything" can be found at this festival and it attracts literally thousands of people every year! Our idea of a great, self-guided day tour is to simply start off by heading south on Rte. 9. You'll pass through sleepy little towns like West Creek, Parkertown and Tuckerton. 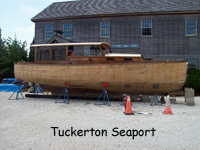 Don't miss the Tuckerton Seaport (picture below to the left) in this town and it's many antique shops! Below Tuckerton you'll experience a part of south Jersey that is truly majestic. Keep driving along Rte. 9 and you'll eventually come to Atlantic City. From here, if you head east out to the ocean, you can drive through Atlantic City and keep heading south, passing through a wonderful stretch of Jersey shore south of A/C... towns like Margate and Ventnor and Long Port. 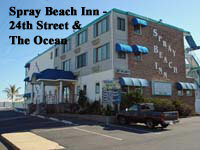 From there, you can continue driving through Sea Isle City and Ocean City. Further still will bring you all the way down to Cape May, but at any point along this wonderful and beautiful drive, if you want to head back up to LBI, you simply head west to the parkway and head back north. If you do it once, it's a drive you'll want to take many times. Carolyn and I never get enough of cruising the beautiful Pine Barrens roads and oceanside routes of south Jersey. 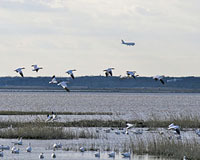 To the right and below is a photo from the Edwin B. Forsythe National Wildlife Refuge. One of our tenants, the Millers from Pennsylvania, recently toured the refuge and reported back to me how wonderful the experience was for them. Their impressions were such that I promised to include mention of the refuge on my website so that others could also enjoy it. 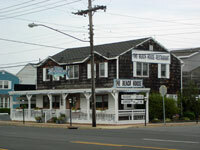 The refuge headquarters is located in Oceanville, NJ, but the refuge itself covers many square miles and is broken down into about 5 different geographic areas of southeastern New Jersey. At the headquarters area is a wildlife drive, many trails and an auditorium featuring seasonally changing wildlife displays. They offer guided tour as well as environmental education field trips. Please visit their website at Edwin B. Forsythe National Wildlife Refuge for much more specific information. This is all a part of New Jersey that very few have ever taken the time to get to know! If it's golf you're after, visit one of "South Jersey's Four Gems," as it's touted, one of four golf courses under one ownership. 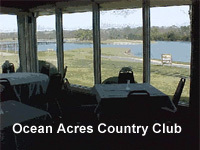 And you won't have to travel more than about 1/2 an hour to get to Ocean Acres Country Club either - it's right in Manahawkin! Take Route 72 West from the island. Just past the "on" ramp to The Garden State Parkway, make a right onto Lighthouse Drive. Follow this for approximately one and one-half miles and make a right onto Buccaneer Lane. The club is just ahead on the right! 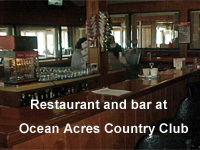 Besides a restaurant and bar, Ocean Acres Country Club also features a banquet facility and catering. Golf Digest says, "Great island par three... accuracy is a must... good back nine, tough to get on... flat, open on front, back tight and better challenge... pleasant course... beautiful back nine." We have several tenants who frequent this golf course every summer and keep returning, so they must be doing something right. 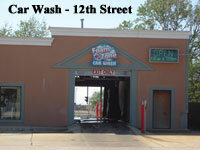 Visit the above website before your vacation starts and give them a call to reserve a time. Or bring the entire family, visit the Pro Shop and sign the kids up for some lessons! Carolyn and I try not to recommend too many places to eat because peoples' tastes are all different and restaurants sometimes change chefs and management. But every once in awhile we'll be asked where we like to go, so we've taken the time to list some of them here. There are, of course, many, many places to try, so please, if you've found a spot you like, do let us know, tell us why, and we'll include it here. 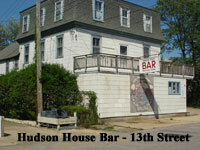 On a busy Saturday night in Beach Haven, it's almost impossible to get into any restaurants. You might have to wait a considerable amount of time to be seated just about anywhere in town you go. 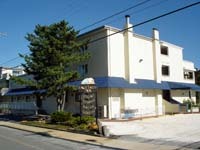 There is one you can usually get into quickly, however, and that's the The Spray Beach Inn, just blocks away on 24th Street (and that's without a reservation). 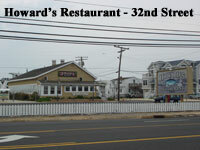 People sometimes overlook the place because when they think restaurants, they think the boulevard. 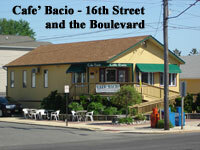 It's probably the best-kept secret on LBI because of this. 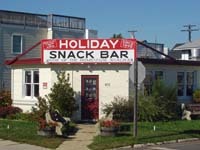 The food has always been good, the service is excellent and there's even a small cocktail bar where you can sit and have a relatively peaceful glass of wine, free from all the crowds downtown! It's even within walking distance! 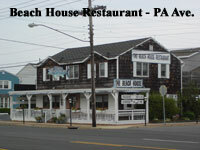 The Beach House Restaurant (pictured left) is on the Boulevard at Pennsylvania Avenue. We go there with some friends of ours who also like it. The food and service there is excellent and the wait is not bad if you can get there early (before 6:00). This is always usually the case on Long Beach Island. If you're going out to dinner, particularly on the weekends, for every 15 minutes beyond 5:30 that you arrive you can count on it costing you at least an extra half-hour in waiting time. The menu at The Beach House is varied and the portions are a nice size. I have to say we haven't had a disappointing meal there recently. Their seafood combo platter is the largest one on the island! 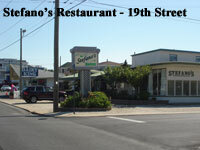 Stefano's, on 19th Street and pictured on the right, is another restaurant that's extremely close by (you can walk there in 5 minutes). But again, if you arrive after 6PM you may have to wait. This is primarily a seafood restaurant with an Italian theme and the chef is always consistent and the service is very good. 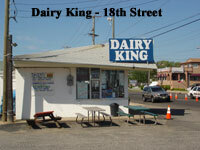 For dessert, you can literally walk next door to the Dairy King! 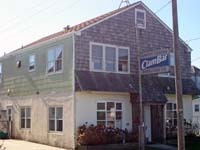 The Engleside Inn in Beach Haven, pictured below left, is a more upscale restaurant if that's what you're looking for. The Engleside also accepts reservations. Their steaks are excellent and if it's sushi you're after, this is the only place to go. We're particularly fond of their Sunday morning brunch, which is a buffet-style breakfast that will not let you down. 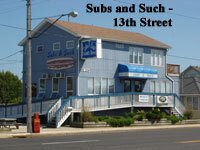 One of our other favorites is Kubel's up at Barnegat Light on the north end. This is a scenic drive up to the north end of the island and the food in Kubel's never disappoints. Kubel's has a charm like no other restaurant/bar on LBI, because it was always primarily a fisherman's bar and the decor hasn't changed in 40 years! Today, Kubel's caters mostly to tourists and locals, but if you have seat at the bar, keep your ears open, because you may still run into some deep-sea fishermen who like to tell tall stories about the many long ocean trips they make out of the Barnegat Light inlet! Kubel's Too, under the same management on the boulevard in Brant Beach, does a good job also, but we prefer the food and the drive up to the original Kubel's just a little better. 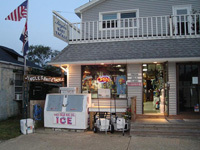 After dinner, you can always buy an ice cream cone at Andy's and just sit on the bench there and watch the boats in the inlet! Out shopping on a rainy afternoon and in the mood for a good Philly cheesesteak for lunch? 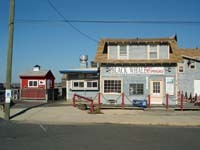 Look no further than Dom's Hot Dog Stand (shown on right) in Brant Beach. 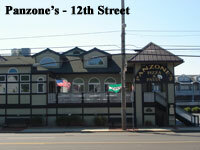 This is "The Home of The Big One," and they are. 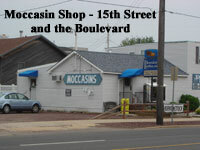 It's a great, reasonable place to grab some homemade soup and a good sandwich. They've got daily specials too. Breakfast is your thing? 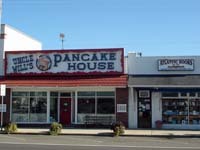 How about Uncle Will's Pancake House (left above) in downtown Beach Haven? Hotcakes come with dozens of toppings and where else will you ever get to sit down next to a pig at the breakfast table? Silly, yes, but your kids will love having their picture taken eating breakfast with a pig! This place gets real busy every morning, but they move the crowd pretty quickly and there's always the bookstore next door to pass the time until your name is called. 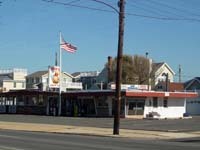 There are many other breakfast restaurants, including Fred's Diner in downtown Beach Haven, which puts out super omelettes in a slightly more formal, less noisy atmosphere. 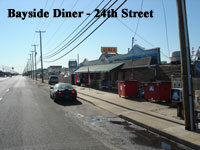 Right around the corner from 16th Street (head north a few blocks) is The Dockside Diner (shown on the left). Formerly Flo's Diner and then called The Bayside Diner, the new owner took it over several years ago and now puts out some great breakfasts. It doesn't look like much from the outside but you won't be disappointed. Try the Iowa Corn Cakes instead of plain pancakes or try one of the several specials, which is sometimes something as unusual as a Mexican Tortilla Omellete with salsa! We hope you'll enjoy some of our favorite spots. This tour doesn't even begin to list all of the eateries, but maybe you'll find a few of your own that you like! Please email us with any suggestions if you come across something you really like! We're always looking for new and interesting places that we haven't tried. And because things sometimes change with restaurants, we'll be sure to update this page frequently, so please feel free to visit and email us with your own dining experiences! Good luck!